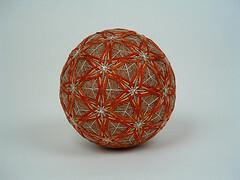 There is this marvelous Japanese art form called Temari. These are decorative balls made of thread (although I have seen them made with metal, wire, and many other materials) that vary from incredibly simplistic to extremely ornate. I never really got past the intermediate phase, but some of the examples I have seen make me wish I still had time to make these lovely creations. The above temari is one I made for an exchange with another member of the TemariKai group. This website is chock full of all sorts of information about temari; how to make them, people who make them, books, examples, and so much more. It is well worth looking at just to view the photos. From what I learned, the origin of the craft was a ball traditionally made by mothers for their children from old kimono thread. From there, the craft burgeoned to the art it is now. 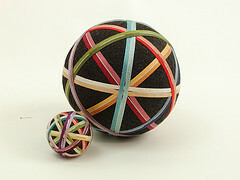 I made them for several years and most of mine started with a thread ball made of stuffing material that you then wrapped miles and miles of thread around until you had a round ball (this takes a lot of practice to get the ball to come out round and tight). Next you mark your center and your guideline threads. Then you begin your pattern. I used DMC thread for the most part to make my patterns and most of mine are in flower formations. My guidelines were usually metallic threads. I made some with tassels, but most without. I also made some with a styrofoam core that I hollowed out and inserted bells. 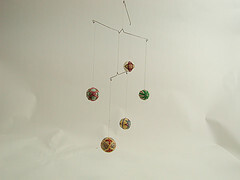 This was a mobile of tiny temari (at most 1 1/2″ in diameter) that I made for Lynne (my mom). 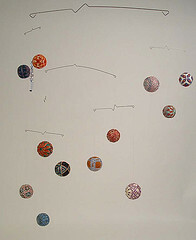 I have always loved making mobiles and this art form seemed to just scream at me “Make me into a mobile!” The photo below is a smaller mobile I made for Loryn (my sister). These are just some examples of temari I made. I made them for most of the family and I still laugh to see them. I made so many that I have forgotten what they look like and who I gave them to. It makes it loads of fun to see the products of my creativity from what feels like new eyes and gives me a whole new perspective on what I consider good, successful work.